Groups or Teams of 5 or more people call for pricing! Oxygenates blood for accelerated recovery. Can reduce the progress of inflammatory and autoimmune disorders such as arthritis, fibromyalgia, MS, etc. A Whole Body Cryotherapy session is a maximum of 3-minutes. The time and temperature are adjusted to suit your specific comfort levels and you can stop treatment at any time by opening the door or telling the operator. How will I feel during and after my Whole Body Cryotherapy session? This is cold therapy so you will feel cold, but for most, it is very tolerable and painless. In fact many find the experience to be invigorating. After the session, your skin temperature will feel cold to the touch but will warm up within 10-15 minutes. You may experience an increased appetite shortly after, as your metabolic rate speeds up through the warming up process. Most clients report a revitalized or energized feeling for 6-8 hours after a session. Many start to experience a variety of the potential benefits the same day of treatment such as reduced inflammation, reduced pain and muscle soreness, improved mood, etc. What is the temperature inside a Whole Body Cryotherapy chamber? There are 3 levels of cryotherapy. You choose your level for your 3-minute session depending on how well you tolerate the cold and your goals for your therapy. Temperatures will reach a max of -90° Celsius (-130°F) to -120° Celsius (-184°F). Your session will begin with the cabin temperature at a very cool but comfortable level. Over the course of your cryotherapy, session temperatures will consistently fall to the desired rate usually within the first 90 seconds. How is the Whole Body Cryotherapy chamber cooled? The Whole Body Cryotherapy chamber is cooled with gasiform air. The gasiform air, or “fog,” is created by introducing liquid nitrogen to atmosphere via a metering process within the mechanics of the chamber. A nearby storage vessel supplies the liquid nitrogen. The fog is then circulated in a vortex around you for up to 3-minutes. No, it isn't. Nitrogen is a non-toxic, natural gas. The air that we breathe is made up of 20% Oxygen, 78% Nitrogen and 2% of other components. Your head will remain above the nitrogen "fog" at all times. Simply put, IT DOESN'T! The only similarity is using cold for therapy in reducing inflammation. You are simply unable to achieve the same results with an ice bath as you experience in cryotherapy. During an ice bath, the cold actually penetrates into deeper skin tissue and can be damaging to the skin, not to mention wet and painful. In a cryosauna, the deeper layers of the skin are never penetrated, yet the body responds on a deeper level. Whole Body Cryotherapy (WBC) uses a dry, surface cold to trigger autonomic, sympathetic, and parasympathetic nervous system responses that work from the inside out. Ice baths work from the outside in and are unrelenting, penetrating cold that can damage skin and nerves. Ice baths may take hours to return circulation to normal levels and are tremendously uncomfortable. WBC increases circulation within minutes of leaving the chamber and is only mildly uncomfortable and painless. Most users report feeling warm within 60-seconds of leaving the WBC chamber. It all depends on your goals for the therapy and on your own body’s response to this method. Some come daily or even twice a day to help manage chronic pain while others may be sufficient for coming 2 or 3 times a week. Some may choose to come only once a week to maintain their results. We try to offer packages and single sessions to accommodate all needs and we offer very affordable packages to accommodate that we also offer a plan for that. Over a short period of time, you will be able to determine individually what is a good schedule to maintain the benefits of cryotherapy. No, this is a dry cold and your skin remains dry. Your skin and hair must be dry and free of lotions. Is it better to workout/strength train before or after a Whole Body Cryotherapy session? Either. Cryotherapy sessions before training or after training both have advantages, although most clients tend to prefer to visit the chamber after training or working out. Clients who prefer a Cryotherapy session before activity normally experience heightened energy levels caused by the vasodilation and those who prefer after experience an endorphin release after their session. The newly oxygenated blood being circulated can increase muscle “pump” and endurance. Most clients prefer Whole Body Cryotherapy sessions after a strenuous workout, due to lactic acid and metabolite production caused by physical activity. The extreme cold of the chamber causes blood to be drawn into the body’s core and with it, inflammation, lactic acid, and metabolites. When the vascular system is shortly looped into the body’s filtration organs, waste and toxins are removed, and oxygen is replenished. Returning fresh nutrient and oxygen-enriched fuel and building blocks to the exhausted source helps to minimize recovery times and soreness. Yes and no. It is highly recommended that anyone under 18 have a valid reason for doing cryotherapy and will be required to have parental consent and waiver sign-off. You must be at least 13 years of age and at least 5' tall to be allowed in the cryotherapy chamber. Consult with your physician for best practices and recommendations. Is there a height and weight limit? We can accommodate clients who are 5' to 6'6" and up to 350 pounds in our cryosaunas. However, you will also have to be able to stand comfortably in the chamber without touching the sides in order to be allowed to purchase a session. We will assist you in accessing and measuring in the chamber for your safety. Cryotherapy comes from two Greek words: “cryo” meaning cold and “therapy” meaning to cure. Cryotherapy was invented in Japan in the 1970’s by Dr. Toshima Yamauchi to relieve pain and treat rheumatoid arthritis. In 1981, Dr. Yamauchi announced that whole body cryotherapy not only significantly reduced pain and inflammation among his patients suffering from arthritis but also had a far greater healing impact on the body. Over the last three decades, leading European physicians and medical professionals advanced the therapy and today WBC is an established and powerful treatment for inflammatory disorders and injuries. The whole body cryotherapy (WBC) is an open-topped cryosauna where clients are briefly enveloped by frosty air. 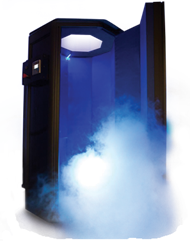 They cryosauna technology lowers the temperature inside the chamber between -90° Celsius (-130°F) to -120° Celsius (-184°F). The treatment is painless and refreshing to many. Treatment activates a response in the body which can include: reduced inflammation, increased energy, lessen muscle soreness and tension, improves circulation, relieves pain from injuries or joint disorders, boosts metabolism and contributes to weight loss, increases collagen production reducing the signs of aging, improves mood via rise in endorphins, helps solve insomnia, migraines, gout and asthma, helps with fibromyalgia and multiple sclerosis, and can aid in preventing osteoporosis. The treatment only takes 3 minutes to perform and it has so many overall health benefits and natural healing potential. Here at The Cryo Effect, we use a top of the line Impact Cryotherapy chamber that fills with nitrogen vapor and drops the ambient temperature anywhere from -90° Celsius (-130°F) to -120° Celsius (-184°F). This significantly drops your skin temperature without doing harm to any tissues. This brief dry chill surrounds your body and signals your evolutionary bio-response to cold bringing your blood to your core via vasoconstriction. Once you step outside our Cryosauna, your body immediately warms up and sends the fortified blood throughout the body to the skin surface tissue, muscle tissue, and joint spaces that have been flushed of toxins. The vasodilation also releases endorphins, which encourages pain relief, healing response, and a boost of energy. As a result of the session, your body’s inflammation has been reduced, endorphins and hormones have been released (providing an energy and mood boost), toxins have been eliminated, and your skin is tightened and smooth from the building of collagen. This three minute (or less) session, provides an invigoration experience and promotes natural healing and well-being. Before your session starts we will pre-cool the chamber. Once you step inside the cryosauna and the door is shut you will need to take off your nice warm robe or towel and hand it over the top of the sauna to the trained operator. The operator will place the top octagon shield over your head and into place and you are ready to begin your cryotherapy experience. The operator will push the "start" button and you will then start to feel the cold, dry, nitrogen vapor surrounding you in a swirling pattern. During the 3 minute session, the operator will talk to you and try to keep your mind off of the chill. You will be reminded to keep your chin up and rotate and move around. You will also hear a beeping sound every 31 seconds. This is a safety alert for the operator to hit the "okay" button to ensure the session is continued. If the operator does not push the "okay" button then the cryosauna will shut off. This is a safety feature implemented by Impact's cryosaunas to keep you safe. During your session you can open the door at any time to stop the machine or tell the operator you do not wish to continue. But before you know it those 3 minutes will be over and you have successfully finished your invigorating experience of cryotherapy. The operator will then hand you your robe or towel to put on and you can exit the cryosauna and get dressed. You may have other conditions that make whole body cryotherapy inappropriate. Consult with your doctor or medical advisor if you have questions as to whether whole body cryotherapy is right for you.